KAREN TIMBERLAKE is Professor Emerita of chemistry at Los Angeles Valley College, where she taught chemistry for allied health and preparatory chemistry for 36 years. She received her bachelor’s degree in chemistry from the University of Washington and her master’s degree in biochemistry from the University of California at Los Angeles. Professor Timberlake has been writing chemistry textbooks for 37 years. During that time, her name has become associated with the strategic use of pedagogical tools that promote student success in chemistry and the application of chemistry to real-life situations. More than one million students have learned chemistry using texts, laboratory manuals, and study guides written by Karen Timberlake. In addition General, Organic, and Biological Chemistry, Structures of Life, Fifth Edition, she is also the author of the Twelfth Edition of Chemistry: Introduction to General, Organic, and Biological Chemistry with the accompanying Study Guide and Selected SolutionsManual, and Basic Chemistry, Fourth Edition, with the accompanying Study Guide and Selected Solutions Manual, Laboratory Manual, and Essentials Laboratory Manual. Professor Timberlake belongs to numerous scientific and educational organizations including the American Chemical Society 1ACS2 and the National Science Teachers Association 1NSTA2. In 1987, she was the Western Regional Winner of Excellence in College Chemistry Teaching Award given by the Chemical Manufacturers Association. 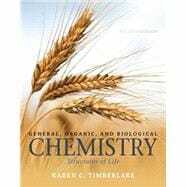 In 2004, she received the McGuffey Award in Physical Sciences from the Textbook Authors Association for her textbook Chemistry: An Introduction to General, Organic, and Biological Chemistry, eighth edition, which has demonstrated excellence over time. In 2006, she received the “Texty” Textbook Excellence Award from the Textbook Authors Association for the first edition of Basic Chemistry. She has participated in education grants for science teaching including the Los Angeles Collaborative for Teaching Excellence 1LACTE2 and a Title III grant at her college. She speaks at conferences and educational meetings on the use of student-centered teaching methods in chemistry to promote the learning success of students. When Professor Timberlake is not writing textbooks, she and her husband relax by playing tennis, taking ballroom dance lessons, traveling, trying new restaurants, cooking, and taking care of their grandchildren, Daniel and Emily.